Finding the best calcium supplement for osteoporosis can be a tricky endeavor, especially now when there are so many options that you can choose from and that look quite similar at a first glance. After a careful examination of some of the best-received products in this line, we have concluded that the option worth getting is the New Chapter Bone Strength. The 3-in-1 complete formula will strengthen your bones, support joint health, and improve the health of your heart. The calcium is accompanied by Vitamin K2 to help direct it to the areas in your bones that need it the most. Similarly, the tablets are slim and soft which makes them very easy to swallow. 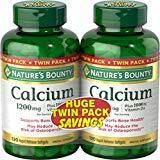 If you are not able to find our first choice available for sale, but you are determined to get a quality supplement, we recommend that you consider the Nature’s Bounty Calcium Pills as it offers similar benefits. While other supplements get their calcium from limestone rock, this alternative uses plant-based sources which contain many of the bone-supportive nutrients that your body needs. What’s more, this product will also help support your joint and heart thanks to the 3-in-1 formula. You should bear in mind that the formula contains fermented soy and wheat, which for some people might trigger nasty allergies. 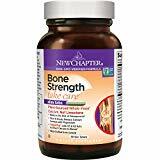 The New Chapter supplement is expertly formulated to give seniors the full benefits of calcium and to help with bone, joint, and heart support. The two bottles contain just the right amount of calcium to fight osteoporosis and the soft gel pills are enhanced with Vitamin D3 to help the body absorb the minerals as well as help strengthen your immune system. Each bottle contains 120 rapid release pills, each filled with 1200 mg calcium and 1000 IU Vitamin D3. The pills are very big, and this is an aspect of the product that you should consider, especially if you have troubles with swallowing. The calcium and Vitamin D3 combo makes this supplement highly capable of strengthening bones and reducing the risks of osteoporosis. The 240 capsules in this bottle provide the right amount of calcium to help promote bone density and help fight osteoporosis. It is the ideal choice for seniors who are not getting enough minerals from food. The formula also contains the right amounts of vitamins to assist in building up the bone matrix. We found many reports saying that the magnesium oxide in the formula can cause issues with the digestive tract for certain people. The Bone-Up formula contains the latest in bone health to help people who don’t get enough calcium from their diet or those who suffer from osteoporosis. We know how time-consuming it can be to find the right calcium supplements for osteoporosis, which is why we have thought adequate to prepare a list of some of the top products currently available. These options stood out thanks to their quality, affordability, and customer satisfaction. While other options on the market get their calcium from limestone rock, since it is a cheaper source, the Bone Strength formula gets its mineral from plants. This feature allows the supplement to provide you with a holistic solution to bone health. Some additional ingredients you will find are magnesium, 70+ whole-food trace minerals and a proprietary blend of vitamins K2 and D3. The unique formula allows this supplement not only to help support bone strength and bone density but also movement, joint function, and joint flexibility. Apart from helping your body absorb the Calcium, Vitamins K2 and D3, it will also function to help maintain artery health, and support the well-being of your heart. One bottle contains 90 slim tables that are very easy to swallow and that will provide a slow and steady release. It is worth noting that since the minerals come from plants, this option is not gluten-free. The huge twin pack will help you save money as each bottle contains 120 rapid release pills. Each soft gel pill contains 1200 mg of calcium together with 1000 IU of vitamin D3 to help assist with calcium absorption as well as boost your immune system and help support neuromuscular health. Quality and consistency are essential when taking any medicine and Nature’s Body is a brand that lives to its name which is why the supplements don’t contain any artificial flavors. As a plus, to help with allergies, the pills are gluten, dairy, and wheat free. It does contain soy though, so you might want to keep this in mind. As far as customer feedback goes, we found many users who were thoroughly pleased with the efficiency of this supplement. While the pills are quite big, especially when compared with some of the other options on the market, customers have found that they are quite easy to swallow. The Bone-Up formula includes a superior combination of the latest breakthrough in bone health. As is expected, the main ingredient is calcium along with Vitamin D which is known to show significant support for bone health. The formula contains more prolonged calcium balance than the soluble calcium salts. The primary source of the calcium is from bovine bone ossein microcrystalline hydroxyapatite (OHC) which contains more than just calcium. A dose provides the right amounts of minerals that your body needs. It is ideal for people who can’t get enough calcium from their diet, or for anyone who follows a high-protein or high-phosphorus diet. While examining the numerous customer reviews, we were glad to find quite a few people who claim to have experienced great results after using these supplements. When combined with exercise, it can help slow bone loss, and it helps tremendously with osteoporosis and many other bone diseases. Nature Made has a long history of 45 years, and that shows in its products, this one included, as the formulas it uses are refined to meet the needs of both seniors and younger people. This supplement combines Calcium with Vitamin D to help with the absorption of this mineral. Two tables provide 1200 mg of calcium which is the recommended dosage for people that require a higher daily intake, such as adults older than 50. The pills don’t use synthetic dyes; the color is instead derived from natural sources. Similarly, you won’t find artificial flavors or preservatives in the formula. The supplement is USP verified to guarantee the quality and purity of the ingredients and the formula. Customers have also noticed immediate results after taking this product, claiming that apart from helping with osteoporosis, the pills have also helped with hair loss and made their nails look healthier. The addition of magnesium and zinc allows this product to provide healthy bone support as well as help enhance nerve, muscle, and metabolic functions. When used as part of a well-balanced diet, the calcium and vitamin D3 will help reduce the risk of osteoporosis, and the magnesium will help support healthy and strong bones. The addition of zinc comes as no surprise as this mineral is necessary for many reactions in the body and also participates in antioxidant processes. Each tablet provides 333 mg of calcium, 133 mg of magnesium, 200 IU of vitamin D, and 5 mg of zinc. Each bottle contains 300 easy-to-swallow tablets. The low price point, high amount of tablets, and potent formula help make this product stand out from the rest. Apart from helping with bone-related diseases, customers have also reported that the unique formula offered by Nature Made can help with anxiety, muscle spasms, as well as skin-related problems. If you wish to get an option that is 100% plant-based and perfect for people who follow a vegan lifestyle, the Garden of Life alternative is a great choice. The calcium and magnesium blend includes vitamin D3 from lichen and vitamin K2 to support your bone health and reduce the risks of osteoporosis. The supplement is easily digestible since it is made from real food, with mineral and vitamins that originate from over 20 distinct fruits and vegetables. The tablets are small and shaped to be easy to swallow with just a little sip of water. It is one of the few options on the market that is USDA Organic certified, Non-GMO Verified, and that does not include synthetic binders or fillers. What’s more, the formula is entirely gluten-free and does not utilize any common allergens. Each of the 180 tablets contains 800 mg of calcium which originates from organic algae. Citracal is a brand that is highly recommended by doctors, and that has a lot to do with the quality of the products it produces. This particular option features a calcium formula that is fortified with vitamin D3 to help your body better absorb the minerals it needs to support your bone health and lower the risk and symptoms of osteoporosis. Each pill features a unique combination of 1200 mg calcium citrate and carbonate and 1000 IU of vitamin D3 that will work with the Slo-Cal technology for an efficient absorption in one single daily dose of two tablets. The addition of vitamin D will allow you to get the benefit of two supplements in a single tablet. Customers have reported good results after taking the pill and were glad that unlike other options that can only be taken with food, the calcium citrate formula allows you to take the pills on an empty stomach. The Petites alternative is perfect for seniors who have a diet based on foods that are high in calcium but are unable to get all the recommended dosage of 1,200 mg per day. Each pill contains 400 mg of calcium citrate which is highly soluble and very easy for your body to absorb. Vitamin D is required for your body to assimilate and regulate calcium metabolism and this is the reason why the Citracal formula contains up to 500 IU of vitamin D3. The Citracal formula is ideal to help seniors fight osteoporosis and osteopenia. Customers were very satisfied with their purchase, but it is worth noting that even if the product bears the petite label, the tablets are just as big as the regular option. You are not required to take these supplements with food, and you can select the dosage depending on your needs, but remember that two tablets is the maximum amount the manufacturer advises. The OsCal alternative is a supplement best used to prevent or treat low blood calcium levels in seniors who do not get enough of this mineral from their diet. It can be used to treat many conditions that are caused by low calcium levels such as osteoporosis, osteomalacia, hyperparathyroidism and muscle diseases such as latent tetany. The bottle contains 210 capsules, and each one features 500 mg Calcium coupled with 200 IU vitamin D3. A lack of Vitamin D is actually widespread in seniors, and this nutrient is essential for normal calcium absorption which is why it is a good thing that this supplement contains it. The manufacturer recommends that you take the medication with food, and if your daily dose is more than 600 mg, you should divide the dose and space it throughout the day instead of taking two pills at once. Customers did not report side effects after taking the supplement. The Caltrate supplements are designed to help keep your bones and your body strong since it uses calcium for most everyday activities including muscle contraction and nerve function. It is important to maintain a diet with enough calcium and vitamin D, and this is exactly what this alternative seeks to provide. The bottle contains 200 tablets, and each tablet carries 500 mg of calcium together with just enough vitamin D3 to help maximize calcium absorption. What’s unique about this option is that calcium and vitamin D3 come in concentrate form which is very important since it allows the manufacturer to produce tablets that are very small. Thus, if you have troubles swallowing big pills, with this option getting your daily dose of calcium will no longer be an unpleasant experience. If you are not yet sure about the quality of this option, a glance at the overwhelmingly positive customer reviews will surely convince you. The Nature’s Body supplements contain all the minerals and nutrients required to help support bone health and strength, as well as improve your general well-being. The bottle contains 300 tablets which makes it an excellent choice for people who wish to get a good value pack. The brand is committed to providing users only the purest ingredients, and with a long history of 50 years, you can be confident that its formula will help you get the most out of life every day. As is expected, the tablets are enhanced with vitamin D to help with the absorption of calcium but also to give you increased immune support. Similarly, you won’t have to worry that the supplements contain artificial colors, flavors, or sweeteners since all the ingredients used come from natural sources. It does not contain milk or lactose, making it a good choice for lactose intolerant people. These supplements provide adequate amounts of calcium for seniors and when combined with physical activity and a healthy diet, they can reduce the risk of osteoporosis. Each serving contains 750 mg of Calcium together with 500 IU of vitamin D3 and 50 mcg of vitamin K, all of which will work together to support healthy bones. The calcium supplement will help not only your bones but also your teeth and muscles. As is expected from a brand that has nature in its name, you will not find artificial colors or flavors present in the formula and all of the ingredients come from wholesome sources. It does not contain yeast and is 100% gluten-free. Seeing as Nature Made is a brand that is very committed to the quality and reliability of its products, it shouldn’t come as a surprise that this option is one of the few on the market that bears the USP Verified mark on the label. USP is an independent organization that tests for quality and purity. Calcium and osteoporosis are closely linked, and if you have a calcium deficiency, your bones will be the ones to suffer. Thankfully there is a straightforward solution for this in the form of calcium supplements. The downside is that since the market is flooded with so many options to choose from, people often end up getting more confused in the process. We want to simplify the entire process for you, which is why we have compiled the following buyer’s guide that will go through the key aspects one should consider when purchasing calcium for osteoporosis. The amount of calcium that you should get from a supplement depends on how much of it you are already getting from your diet. Men over 70 and women over 50 require 1,200 mg per day while an adult needs 1,000 mg. Before you decide to get a supplement, it is best to check with your doctor to know exactly how much you need. Another thing to remember that if, for example, you need to get 1,000 mg of calcium per day from supplements, you can’t take it all at once since the more calcium you take, the more difficult it will be for your body to process it all. This is why it is recommended to take smaller amounts at each meal throughout your day until you reach the desired total. Make sure that you don’t go over your recommended daily amount since if you go overboard, your body will have to get rid of it through the kidneys which will raise the risk of kidney stones as well as hardened blood vessels and tissue. There are two types of calcium that you are likely to find in supplements, and the more common of the two is calcium carbonate. If your tablets contain the carbonate variety, you will need to eat something when you take it because this type needs to react with the acid in your stomach for the best results. The other type available is calcium citrate, and we found that customers who have a hectic schedule tend to like this option more since it is possible to take it on an empty stomach. Vitamin D gets produced by your body when sunlight hits your skin, and very few people get enough of it through natural means. It is also possible to get it from some foods such as fish, egg yolks, cheese, and certain foods that have added vitamin D such as juice, cereal, or milk. The reason why vitamin D is so essential to help you fight osteoporosis has to do with the fact that your intestines absorb the calcium from the foods you eat with the help of vitamin D. This is the reason why you will find that most calcium supplements on the market include just enough vitamin D in each tablet to help your body absorb all the minerals. While we can’t say for certain if you will encounter a side effect when taking a particular type of calcium supplement, there are a few things you can do to protect yourself. In case you know you are allergic to certain ingredients, you should take the time to read the entire list since some options may get the calcium from natural sources such as grains. When switching to a new type of calcium supplement, you should start with a small daily dose of 200-300 mg for around a week and build it up gradually since this way if you experience a side effect, it won’t affect you as much. Some of the side effects you can experience are gas, constipation, and bloating.